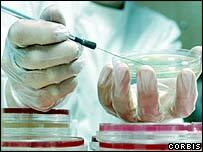 BBC NEWS | Health | Have the scientists gone too far? "Aborted foetuses to be harvested to give their eggs to infertile women!" "Embryos to be merged to create "chimaeras" that are actually two people in one!" "Give birth to a child from the womb in which you were conceived!" Anyone reading the reports from a recent conference in fertility science would be forgiven for thinking that we have descended into a bizarre world in which hundreds of mad scientists are competing to produce the most bizarre permutations of human life. The headlines read more like posters from the freak shows of the old American West than a showcase of the brightest and best in the world of reproductive medicine. The question is posed: A quarter-century after the birth of the first test-tube baby, Louise Brown, is this a science and industry running out of control, and out of touch with the wishes of society? But while the world recoils in horror, so do those at the heart of this specialty, who, in the public perception, are lumped together with those pushing at the ethical boundaries of science. The agenda for the European Society for Human Reproduction and Embryology conference in Madrid is nearly an inch thick - each research project within it takes just a handful of paragraphs in small print. What this means is that 99.9% of the research on show here is not designed to shock or inflame, but concerned itself with the routine nuts and bolts of fertility treatments that are 25 years old this month. It follows, by implication, is that the vast majority of those responsible for this research, once you subtract those with an understandable desire to attract acclaim and funding, are simply trying to improve the lot of their patients without pushing their way past ethical boundaries. But, when the public is choosing its reading material for the breakfast table, it is generally not interested about subtle changes in the liquid you use to culture sperm and eggs in the laboratory, or experiments testing new combinations and doses of fertility drugs. It is these modest papers which might mean a couple has a 30% chance of conceiving rather than a 25% chance, or that a woman has a slightly smaller risk of a dangerous reaction to her medication. Not exactly earth-shattering - but pretty important if you are actually undergoing treatment. Dr Francoise Shenfield, an expert on the ethics of fertility treatment based at University College London, told BBC News Online: "What we are doing is all about helping our patients, offering better, safer, treatments - we are not 'mad scientists'. "But there are still plenty of people who think this is some kind of 'Brave New World' baby factory. "I suppose the kind of stories we have seen this week give us the opportunity to say that it isn't." But Dr Shenfield agrees that scientists are sometimes their own worst enemies when talking about their work, either giving an overly "clinical" assessment of subject matter that provokes an instant emotional reaction in the guts of Joe Public, or hyping the potential of their findings, when the truth is that the chances of success are vanishingly small. "We are trying to offer training to our scientists on how they should communicate this kind of information when talking to the press, or the public," she says. Even though a researcher says that aborted foetuses could one day be a viable source of donor eggs for IVF, it is quite clear that not only is the technology is far from certain, but that other, far more ethically acceptable alternatives will be available long before it is. Likewise, the chances of any ethical body giving permission for a chimaeric embryo - a blend of two people - to be implanted in a human is unrealistic even in a decade. The current president of ESHRE, Professor Arne Sunde, says that mainstream scientists are "at a loss" as to how to change public perceptions of fertility researchers as "mad scientists" uninterested in the ethical implications of what they do. "We haven't been able to give the impression that within the scientific community we take great account of the ethical considerations," he says. Excluding the most extreme researchers from conferences such as this week's is not the answer, he says, and neither is clamping down on ethically or scientifically dubious research around the world. Both would force the mavericks underground, quietly filing their patents from laboratories in unregulated corners of the globe. "If we become more conservative in Europe, or the US, it will simply go to the Middle East, or somewhere else. "But just because we allow someone to speak at this conference, it doesn't mean that we all agree with what he or she is saying," he says. And he recognises that, in the end, science needs the odd maverick to think the unthinkable - because that is how great ideas come to the surface, even if most only succeed in firing scientific blanks or outraging the Roman Catholic church. "When the idea behind ICSI - the injection of a single sperm into an egg - came out, I said it was impossible. "And there were many people who said that Bob Edwards, one of the first pioneers of IVF, was mad." The true message from the conference is clear - the fine-tuning of fertility treatment continues, and it is slowly getting safer, more reliable, and more effective, giving many more couples the chance to fulfil their dreams of parenthood. But without the unconventional scientists, there would be no IVF, no Louise Brown, and probably no conference.